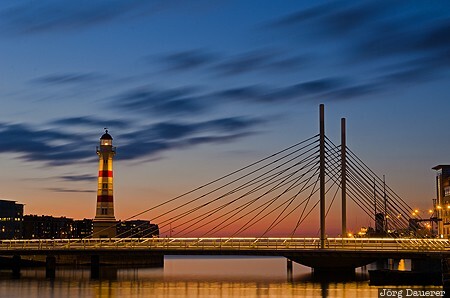 The modern bridge "Universitetsbron" and the flood-lit lighthouse Inre Hamnen in Malmö in front of a colorful sunset sky with fast moving clouds. Malmö is in Skane län in the south of Sweden. This photo was taken in the evening of a sunny day in September of 2014. This photo is part of the exhibition Lighthouses of Northern Europe (Oct'15). This photo is in the Photo Calendar "Südschweden". This photo was taken with a digital camera.